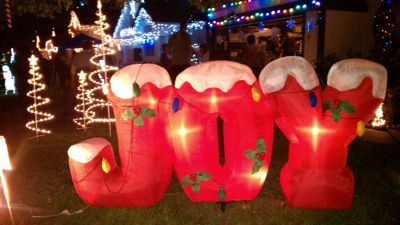 Fairway Village may be best known for it’s amazing neighborhood Christmas light celebration every year. Nothing’s merrier than a Christmas light display, especially one where almost the entire street is lined, house after house, lit to the hilt, with thousands of colorful twinkling Christmas lights and displays. Fairway Village started this tradition many years ago, and continues it every year. The neighborhood has been featured on local newscasts and newspapers, including San Diego Family Magazine, as well as highlighted on the web as one of the best Christmas shows in San Diego. Light shows can be found up from December 1st through January 1st, and the “normal” operating hours are dusk to 10:30 pm each night. On the Saturday evening before Christmas, residents of Fairway Village hold a public neighborhood block party that is out of this world. Hot chocolate, cider, music, lights, cookies, snacks and more are found at almost every home. It’s become a tradition to walk from house to house and sample the good friendship and holiday warmth. Santa Claus has been known to ride a big red fire truck down the street, depending on weather and the workload at the North Pole. Some families play holiday-themed movies on the sides of their houses, have carolers and dancers, and even synchronize lights to music. The public is welcome and invited to visit during the block party, giving everyone a perfect opportunity to walk the neighborhood, enjoy the lights and festivities, and sample tasty snacks and hot drinks. This is not a neighborhood-only event! For those who want to walk the neighborhood, we recommend you park along Shoal Creek Drive, and enter the west end of Stoney Gate Place. Since the street is a cul-de-sac loop, it’s convenient to start down one side and come back on the other. It’s perfect for kids and strollers, as the sidewalks are completely flat and well maintained. Stoney Gate Place to the west also participates in this event, and offers another whole block of beautiful homes to view. Directions: Navigate to Highway 56/Ted Williams Parkway, at the I-15 freeway, and go east to Shoal Creek Drive. Turn left at the light. Stoney Gate Place is the entrance to Fairway Village. Note: If Christmas Day or Christmas Eve fall on a Saturday, then the block party will be held on the Saturday prior to the date. For example, if the Saturday before Christmas is the 24th, then the block party will be held on the 17th of the month.